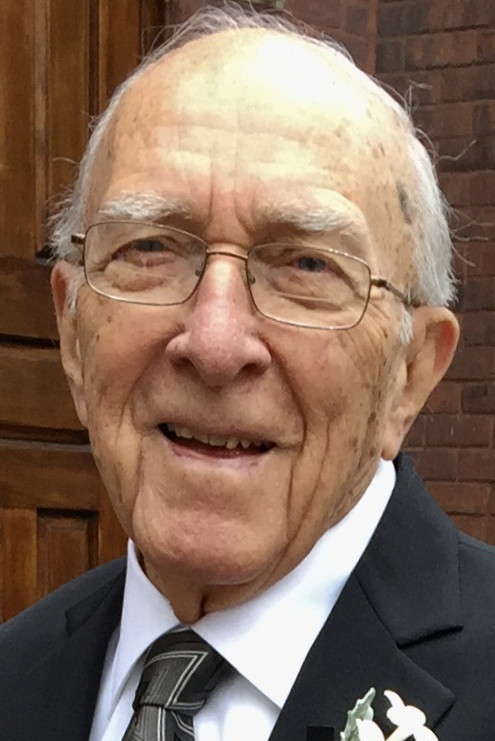 Douglas E. Benson, 93, of Jamestown, passed away Friday, January 18, 2019 at the Lutheran Home and Rehabilitation Center, just 12 days shy of his 94th birthday. He was the husband of the late Shirley Christopherson Benson, whom he married September 10, 1949 and who died March 14, 2009. Doug was born in Erie, PA on January 30, 1925, a son of the late Everett and Gertrude Robb Benson. He was a graduate of the Jamestown High School Class of 1943. He earned his Bachelor’s Degree in Economics at Allegheny College in 1950 where he was a member of the Phi Delta Theta fraternity. A U.S. Army World War II veteran, he was an infantryman with the 94th Infantry Division in Europe and also fought alongside the French Resistance. He maintained a close connection with the 94th by attending yearly conferences and reunions since his discharge in 1946. His decorations included the Combat Infantry Badge, Bronze Star, Victory Medal and the German Occupation Medal. He also received the European Campaign Medal with four battle stars representing Northern France, Ardennes, Central Europe and Rhineland. Doug enjoyed a successful career in purchasing, beginning with Croft Metal in Mississippi and continuing with the Blackstone Corporation in Jamestown and Addressograph Multigraph Corporation in Cleveland. In 1994, after 20 years, he retired as Vice President of American Locker Group and Vice President and Secretary of Signore, Incorporated. He was a member and past President of the Jamestown Manufacturing Association. He was also appointed to the Jamestown Board of Public Utilities from 1971 to 1974, serving as chairman from 1972 to 1974. Doug loved to travel with his wife, Shirley. Always a strong patriot, many of their trips included visits to locations where he had served during the war. He was a dedicated Detroit Tigers fan. He was a member of St. Luke’s Episcopal Church, Rotary Club of Jamestown, and the American Legion Ira Lou Spring Post 149. Surviving are three daughters: Deborah (Deke) Kathman of Jamestown, Cynthia (Craig) Neelen of Pittsburgh PA and Kerrin Bloomquist of Jamestown; nine grandchildren: Jason (Kristen) Kathman of Jamestown, Jacob (Sarahmona) Kathman of Buffalo, NY, Joseph (Anne) Kathman of Orlando, FL, Jonathan (Katie) Kathman of Charlotte, NC, Michael Friedman of Louisville, CO, Joel (Ashley) Friedman of Naperville, IL, David (Maria) Friedman of Pittsburgh, PA, and Abigail Bloomquist and Emma Bloomquist, both of Jamestown. His companion, Betty Beckstrand, also survives him. Surviving too, are thirteen great-grandchildren: Kate and Thomas Kathman of Jamestown, Isaac, Ryan and Andrew Kathman of Buffalo, NY, JoAnna, MaryKate and Grace Kathman of Orlando, FL, Graham and Owen Friedman of Naperville, IL, Anna and Sarah Friedman of Pittsburgh, PA, and Keira Bloomquist of Jamestown; as well as many nieces and nephews. In addition to his wife, Shirley, Doug was preceded in death by a brother, Robb Benson; son-in-law, Jeffrey Bloomquist; and Bram Friedman. The funeral will be held at 11 a.m. Saturday, January 26th at St. Luke’s Episcopal Church, 410 North Main Street, Jamestown. The Rev. Luke Fodor will officiate. A private, family burial will be in Lake View Cemetery with full military honors. Friends will be received from 4 to 7 p.m. Friday in the Lind Funeral Home. The family suggests memorials be made to the Robert H. Jackson Center, 305 E. Fourth St., Jamestown, NY 14701. To leave a message of condolence, please visit www.lindfuneralhome.com.